Crater Lake National Park was established in 1902 as America’s fifth National Park. The Park sits in the Oregon Cascades about 110 miles from the California border and 100 miles east of the Pacific Ocean. The Park is open all year but the annual snowfall is over 44 feet (or 533 inches – WOW) putting many of the Park’s roads, boats, and trails out of commission from October through June. 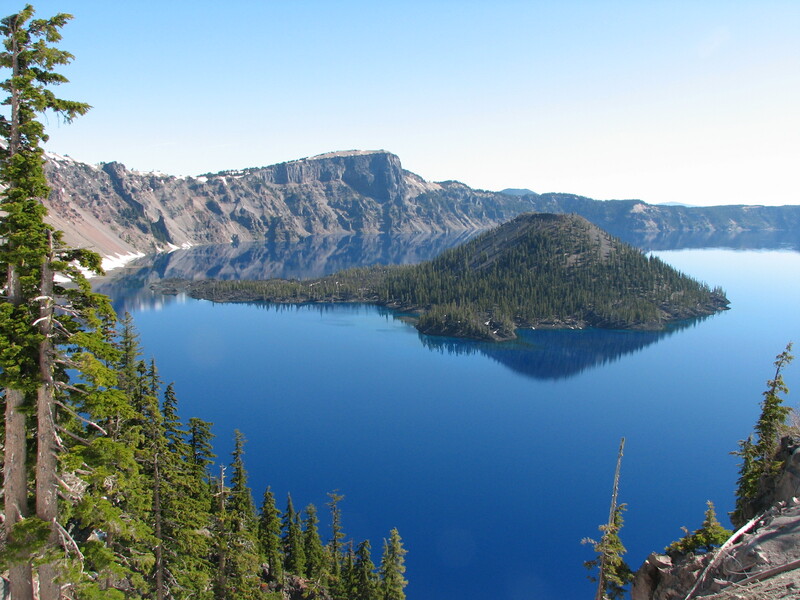 Formed after a massive eruption 7,700 years ago, the caldera that forms the lake was created. The lake is 1943 feet deep – the deepest in the US and the ninth deepest in the world. 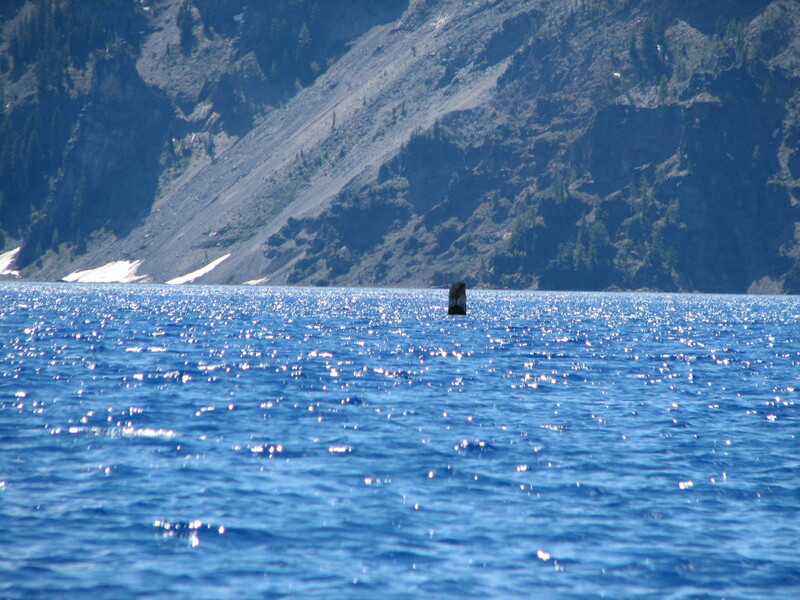 A unique feature of the lake is that is formed by snowmelt and rainfall – there are no inlets or outlets for water flow to or from the caldera. That is one of the reasons that the lake is so clear and pure. There are no organic materials or sediment brought in. in 1994 an experiment was conducted that showed clarity of an object 134 feet below the water’s surface. No wonder it is some of the purest water on the planet. Rim Drive – The 33 mile Rim Drive circumnavigates the caldera and provides stunning vistas from points all around the lake. The mission of the engineers was to create a road that would naturally blend into the landscape and not ruin the beauty of the area. They succeeded in that effort with the careful placement of the roadbed and rock work to conceal the road as well as provide protection from drop-offs. The drive was listed as a historic district on the National Registry of Historic Places in 2008. Due to the heavy annual snowfall, the road typically closes October through June. Crater Lake Lodge – The lodge opened in 1915 and offers incredible views of the lake along with beautiful sunrises and spectacular starry nights. The public spaces are warm and inviting with fireplaces to curl up with a good book and areas to play a board game or two. Their dining room is rustic and modest but the food is very good and will be a nice addition to your experience. When booking your room please note that all have bathtubs but not all have showers. Request a lake view room to really enhance your stay. Due to the severe weather conditions the cost for upkeep of the lodge was a problem from the start and in the 1970’s & 80’s there was a plan circulating to demolish the building. Public outcry kept the lodge open until it was forced to close it’s doors in 1989 because it was deemed unsafe to open. The National Park Service began a complete restoration of the Lodge in 1991 and in May of 1995 it reopened to the public with a price tag of $15 million. 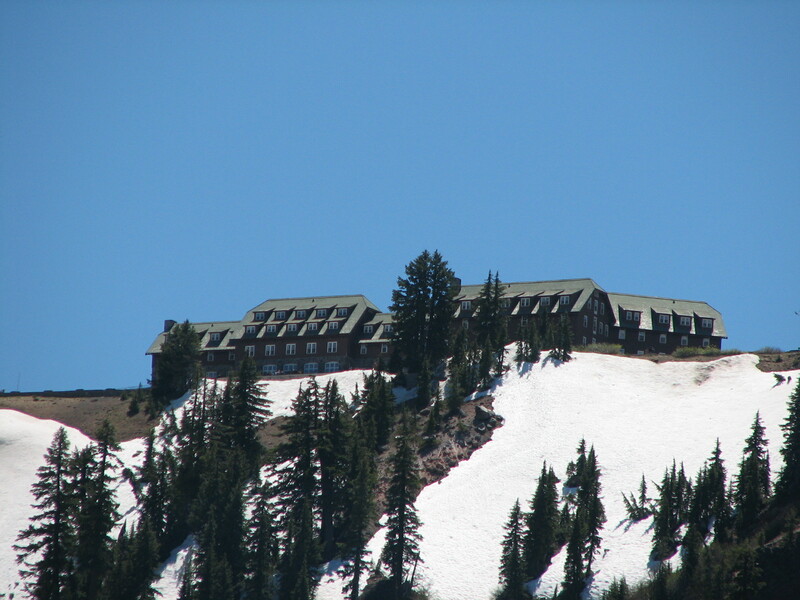 The Crater Lake Lodge is a great member of the National Park Lodges and shouldn’t be missed. Wizard Island – Climbing 750 feet above the surface of the lake is Wizard Island. It is a volcanic cinder cone that erupted after the caldera began to fill with water – sort of a caldera within a caldera! This rocky island is a must do if your timing allows and weather permits. Getting to the island is an adventure in itself. You’ll start your trek by making your way over to Cleetwood Cove located on the northern side of the Rim Drive, and the only access point to the water. In order to get to the boat dock there is a 1.1 mile hike down to the dock – there is a 700 foot elevation drop and can be considered moderate to strenuous to some, depending upon your physical condition. Take it slow and you should be good. Remember, as with all pathways like this, you’ll have to climb out at the end of your adventure so plan accordingly. There are several boat excursions available on the lake but only one that will take you to the island. You’ll need reservations so make sure you book them ahead of time. The boat trip is half the fun as it is truly incredible to be on this clear deep blue water. Once on the island take the .9 mile hike up to the top of Wizard Island. Great views all around and an entirely different perspective of the caldera from within. This is a photographers dream location and your head will be spinning on what to snap that next pic of! The Old Man of the Lake – Floating upright for the past 100 years has been a large piece of mountain hemlock. It can catch you off guard if you aren’t familiar with it and it is a fun activity while you visit the park. We were fortunate during our visit because the Old Man wasn’t too far off the island and we got a good look at the old guy. Another impressive sight in the lake is a small island called the Phantom Ship which you get the best view of from the water (but it can be seen from the rim as well). This island looks desolate from above but there are actually seven different trees that grow on this tiny outcropping along with colonies of violet green swallows. There is often more than meets the eye everywhere – you just need to look! 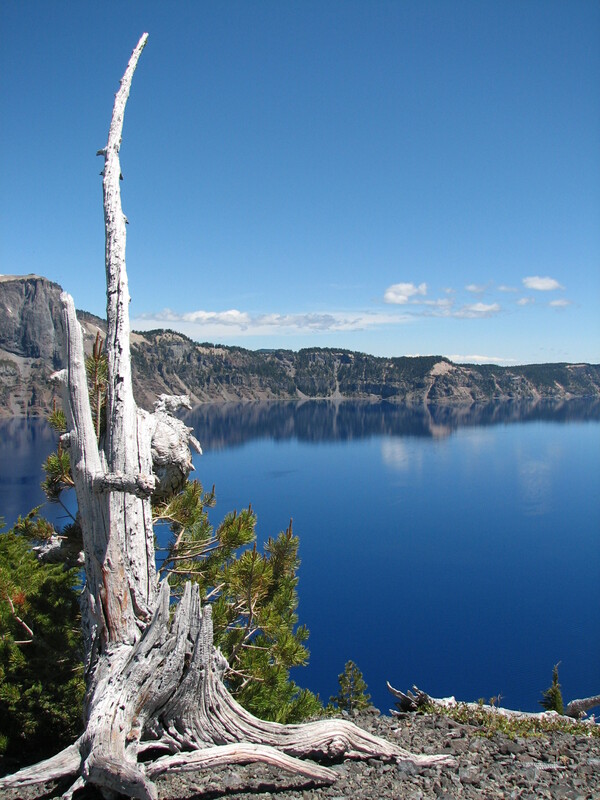 Hiking the Park – With over 90 miles of hiking trails there is plenty of other ways to get up and get out at Crater Lake. They range from short easy hikes to strenuous day hikes. The moderate Watchman Peak trail was on our list which was to offer panoramic views but we were thwarted by snow (the snowfall was particularly heavy that year and most of the trails were snowed in until mid to late July! This hike is one of the park guest’s favorites because it offers up yet another perspective of the lake from a higher vista point. We are looking forward to our next trip to Crater Lake when the weather is a bit more on our side so that we can tackle many of these hikes that have been calling us. Crater Lake National Park is spectacular and should definitely be on your National Park Bucket list. Get Up and Get Out to #FindYourPark! Catch our Weekly Travel Log Updates on Blab.im. Search for emersonwbnl and you’ll find us!